The dominant paradigm in science is that mind is an emergent property of the brain whereas Buddhism sees mind as forerunner. If Buddhists want science to recognise the Buddha’s claims about the mind then Buddhism has to play by the rules of science. The burden of proof is upon Buddhists to devise experiments that show beyond reasonable doubt that purely mental activity can be detected and measured independently of matter. Until then, any talk of “Scientific Buddhism” is meaningless. Buddhism isn’t science. The dominant paradigm in science is that mind is an emergent property of the brain whereas Buddhism sees mind as forerunner. Science experiments can be devised to measure the impact of brain/body chemistry on the mind, but no one seems able to devise experiments that measure the mind’s impact on the body in a way that definitely rules out other material causes. If Buddhists want science to recognise the Buddha’s claims about the mind then Buddhism has to play by the rules of science. The burden of proof is upon Buddhists to devise experiments that show beyond reasonable doubt that purely mental activity can be detected and measured independently of matter. Until then, any talk of “Scientific Buddhism” is meaningless. Personally, I don’t see that Buddhism needs scientific endorsement. 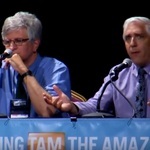 It’s only when Buddhism tries to sell itself as a non-religious “therapy” (in order to convert and recruit non-religious folk into the Sangha) that it runs up against the kind of problems highlighted in the TAM 2014 panel video below. Obviously I’m not against dialogue between Buddhism and Science, just as I’m not against inter-faith dialogue. However Buddhists cannot expect science to accept the Buddha’s truth claims as “scientific” if these claims are beyond the possibility of experimental science falsification. This entry was posted in Meditation and tagged buddhism, meditation, mind, mindfulness, science, therapy. Bookmark the permalink.